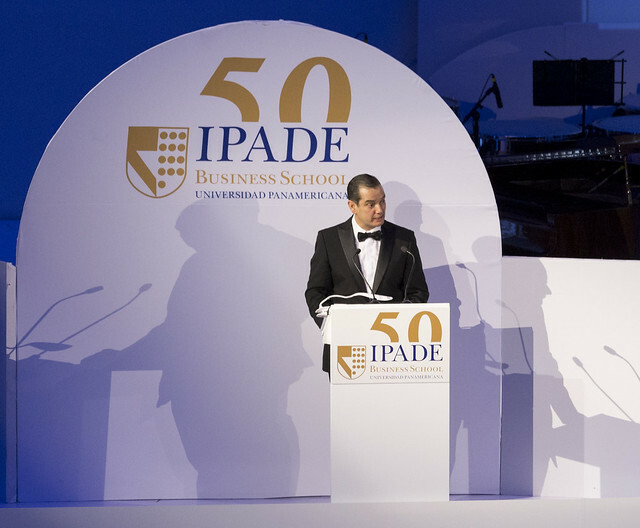 On Thursday, March 30, IPADE kicked off its 50th anniversary celebrations with a gala dinner in celebration of the Mexican business community. The event was hosted at the Colegio de San Ignacio de Loyola Vizcaínas. The event gathered together distinguished IPADE alumni, business leaders, entrepreneurs, business journalists, and special guests to celebrate the first five decades of IPADE’s work inspiring persons and developing leaders. Representatives from business schools from 31 countries in Asia, North America, Latin America, and Europe were in attendance, as well as representatives from the AACSB, EFMD, and AMBA, the primary business school accreditation organizations. Distinguished international guests included Dr. Nitin Nohria, Dean of Harvard Business School; Dr. Franz Heukamp, Dean of IESE Business School; Professor Dominique Turpin, former President of Swiss business school IMD; Dipak Jain, Dean of Thailand’s Sasin Graduate Institute of Business Administration, and many others. To close, Dean Gómez Nava introduced Mexican composer Dr. Samuel Zyman and the world premiere of his new work “Horizontes: reflexiones sonoras hacia la virtud” (Horizons: sound reflections toward the virtue). Commissioned by IPADE in honor of its 50th anniversary, the orchestral piece was inspired by the work of the business director. Dr. Zyman, a professor at the Juilliard School in New York City, shared a few words with the audience about his creative process and inspiration for the composition. The piece was performed by the Symphony Orchestra of the Fine Arts School of the Universidad Panamericana (UP), under the direction of Dr. Gabriel Pliego. Following the conclusion of the performance, Javier Lara Bayón, Researcher with Editorial Clío, presented the book 50 años de servicio a la comunidad empresarial (50 Years of Serving the Business Community). This book provides an overview of IPADE’s first 50 years, focusing on the significant contributions IPADE has made to Mexican society. Renowned Mexican historian and public intellectual Dr. Enrique Krauze then took the stage to share a few words with attendees regarding the book and its companion documentary film. “At Editorial Clío, it has been a privilege to work on this book and to produce the documentary program that reached hundreds of thousands of viewers,” said Dr. Krauze. Dr. Krauze highlighted the role that IPADE plays in continuously improving the Mexican business community, but also the role it plays in terms of advancing a broader understanding of the modern businessperson’s role in society. With Dr. Krauze’s potent challenge ringing in their ears, attendees were then invited to enjoy a gala dinner and cocktail in recognition of IPADE’s 50th anniversary.